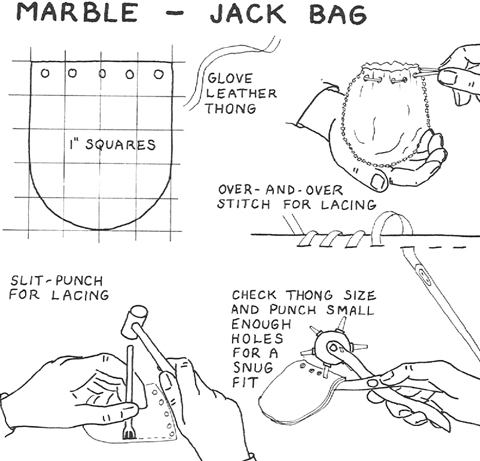 This bag of soft glove leather (or vinyl) is suitable for either marbles or jacks, and is of a size to fit the pocket. This is a great craft to make at Summer Camp as they have all the leather tools that you will need. Cut a cardboard pattern, according to the illustration, and use this to mark two pieces on the wrong side of the leather. Put cement on the side and bottom edges of both pieces, and press wrong sides together with the fingers. This will hold the leather for punching and lacing. Punch round holes at the top for the leather thong, which is cut out of the same glove leather. Slit-punch the bottom and sides, using the over-and-over stitch. Fasten loose ends inside the bag with cement.